We all know someone or some family that has been affected by cancer. This is a tragically beautiful story of a wonderful young man who along with his father is battling this terrible disease together. His father, Freddie Sr. is also battling cancer. They are going through this journey together. This is their story of love and faith and service to others. They are part of the Big Hearts under the Big Sky family. Freddie was nominated for a Big Hearts trip experience by a case worker from the hospital where Freddie receives his medical treatments. In her nomination she shared, “Freddie is a wonderful young man who voluntarily accompanies me on counseling rounds visiting with other young patients when they are first admitted to the hospital. Freddie’s calming manner helps them understand what the treatments are like and why they are being done.” His trip to Montana provided an opportunity for him and his father, Freddie Sr., to share time together, make memories and find the healing power we know exists in the wilds of Montana. A dream trip that neither he, nor his father, would otherwise get to experience. Freddie, a 16 year-old young man from Mississippi, is battling cancer for the second time. His cancer relapsed and he had to undergo treatment that will save his life…again. A diagnosis of T-cell acute lymphoblastic leukemia came on February 17th 2013 for Freddie Jr., who was then treated at the Children’s Cancer Clinic at Batson Children’s Hospital in Mississippi. He made it through chemotherapy treatments all the way to remission. His relapse meant that Freddie would have to undergo the agonizing experience of undergoing the treatments for a second time. To compound the situation it was soon discovered that Freddie’s dad, Freddie Sr. had been diagnosed with a form of kidney cancer. The two were joined by more than a name and a bond of father and son, they were both battling cancer…together. Throughout this ordeal Freddie and his father kept a positive outlook and both placed their faith in God and the healing hands of doctors and nurses that cared for them. One of the remarkable relationships Freddie forged during his ordeal was with Tiffany Key and Michelle Chambers, child life specialists, who have been with Freddie every step of his journey. In the face of adversity, attributed to his own disease and that of his fathers, Freddie tapped his gift of compassion for others which he freely shared with other young people who were battling cancer as well. Freddie became that “good big brother” that others could turn to for advice and guidance, all the while burdened by his own mental and physical load. Because of his experience, and his willingness to share it, Freddie has been able to comfort many young people who have been diagnosed and were scared about the chemo treatments or were upset about losing their hair. Freddie can tell them about it because he knows what it’s like and what to expect. He does this in a calm reassuring manner that is a great comfort to them. This is a role he accepted on his own – he just does it, according to many at the hospital. Freddie is regularly seen all over the hospital mentoring and comforting current patients, even when he doesn’t have an appointment, just to help others get through what he has gone through. It was his relationship with Key’s that ultimately led him to Montana and a Big Hearts under the Big Sky experience. Together they had searched for something that Freddie and his Father could do together, to get away from the hospital and to make a few treasured memories. That prompted a call to Catch-a-Dream Foundation, one of the Big Hearts program best partners. 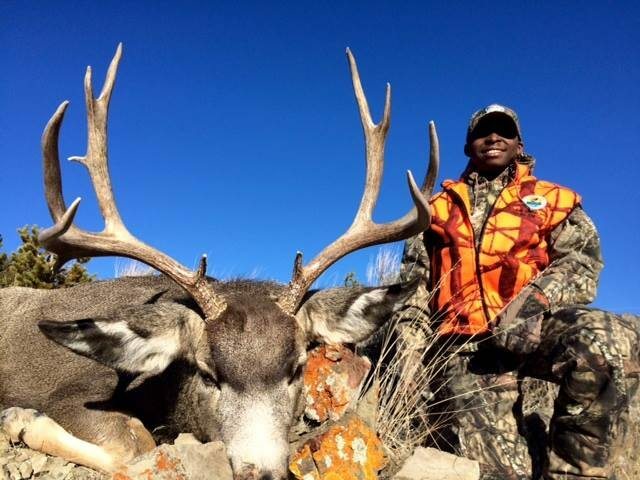 It was quickly determined that they wanted a Montana mule deer hunt and the Big Hearts program was enlisted to put it together. Big Hearts under the Big Sky is the philanthropic arm of the Montana Outfitters and Guides Association (MOGA) and for the past nine years has placed children facing a life-threatening illness and military men and women who have provided extraordinary service to our country on therapeutic outdoor adventures. Who better to help make this trip a reality then a licensed Montana outfitter working as part of the Big Hearts program? Neither Freddie nor his dad had much experience shooting or hunting before the trip and were thrilled at the prospect of spending time in the field searching for a nice mule deer buck. 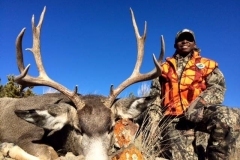 Freddie collected a terrific mule deer with a single shot earning him the nickname “One Shot Freddie”. His father and the Catch a Dream trip host were delighted and proud. Freddie beamed. But the trip is never just about the harvest of an animal. A Big Hearts trip experience extends far beyond the hunt or catch, sprits are healed, capabilities and confidence expand, a sense of purpose and future rediscovered and along the way families and faith are restored. In the end we were so proud to have been a part of helping Freddie and his father share the unique experience that time in the field; as father and son, provides. We are honored to be associated with this remarkable and caring young man and the man who raised him. We welcome both of them with open arms to the Big Hearts family! This trip could not have been possible without the support of so many individuals and businesses. In addition to Outfitters Sandy and Scott Sallee, our partner Catch-a-Dream Foundation, thanks go to Rich Bradberry of Wildlife Artistry LLC, Yellowstone Wild Game Processing, and Karl Knuchel of Sport Livingston, who underwrote Freddie’s celebration dinner. Len Wright helped Freddie get comfortable with his rifle at the Park County Rod and Gun Club. Some of Sandy and Scotts clients generously and anonymously donated money to defray expenses. They are all part of a community based opportunity to give back to someone who has endured so much and given so much to others. God Bless you and your father Freddie!